Just as modern urban planning uses quantitative tools analysing traffic flows and roadway air dispersion models to demonstrate current versus future state benefits, perhaps information architecture might adopt quantitative visualisation tools to analyse and report on business transformation associated with data and information flow. Network analysis interrogates and illustrates connections/ties between and among individuals, groups, systems, and organisations, termed the nodes. Organisational network analysis has been termed an ‘organisational x-ray’, as it helps reveal the real, informal organisation at a point in time; that not revealed or represented by a hierarchical organisation chart. Consequently, network analysis may provide illuminating insight into how organisations share data and information, both internally and externally, before and after business transformation. The paper explored current and potential means of demonstrating the value of information architecture in business transformation through network analysis and associated tools. 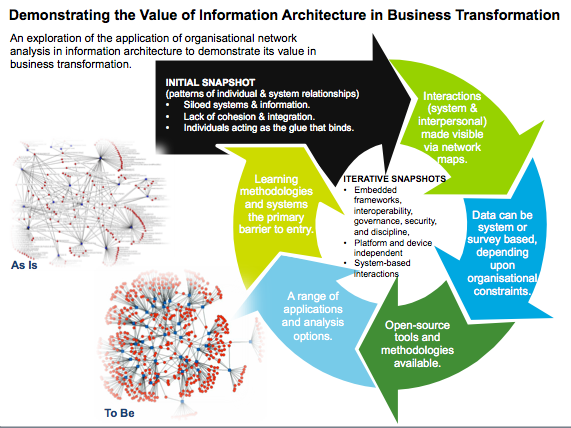 In my view, network analysis can provide a vivid map of current information use and opportunities for information architecture improvements, and is certainly worthy of consideration to support information architecture for business transformation. As noted by the organisers and supporters (including the Australian Computer Society and Institute of IT Professionals New Zealand), these three disciplines provide the basis for establishing an IT capability that supports business agility, operational excellence and effective decision making, with the purpose of holding the conferences together being to encourage knowledge transfer and identify synergies between the interrelated disciplines.